Please welcome the new UCCE dairy advisor for Tulare and Kings Counties, Dr. Joao Paulo (JP) Martins. JP was born and raised in Rio de Janeiro, Brazil. Although he was from a big city, his parents owned a 20-cow dairy farm in the Brazilian dairy state of Minas Gerais. During his youth, he spent most of his weekends, holidays and vacations working on the farm; these early experiences with cattle motivated him to attend veterinary school in Brazil. Dr. Martins earned a DVM degree from Federal Fluminense University (UFF), Niterói, RJ, Brazil, and spent a year as a private veterinarian in Brazil. Then, he came to the United States to work as a research assistant and laboratory manager in the Department of Animal Science at Michigan State University (MSU). JP also earned a M.S. and a Ph.D. in Animal Science, both with a concentration in dairy cattle reproduction physiology, from Michigan State University. The objective of his research during graduate school was to increase the fertility of high producing dairy cows through the use of synchronization of ovulation programs. During his professional and academic carrier, JP carried out work related to herd health, reproductive management, cattle breeding, synchronization of ovulation, in vitro fertilization, and superovulation in commercial (beef and dairy) farms in Brazil and the United States. He also served as an expert in multiple uses of ultrasonography (ovarian morphology, pregnancy diagnoses, fetal sexing, and oocyte pick-up), developed experimental designs and managed research data collection for experiments with small and large numbers of animals, and troubleshot reproductive problems in dairy farms. 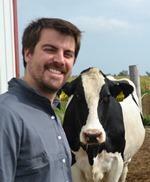 “I’m thrilled to be working in a research/extension position in such a great dairy area. I’m looking forward to working with producers, consultants, and allied industry to develop meaningful trainings and tools, as well as readily applied knowledge for dairy producers. My goal will be to develop a research and outreach program that will contribute even more to the competitiveness and profitability of California dairies. I’m based out of the University of California Cooperative Extension office in Tulare, but cover both Tulare and Kings Counties. Please feel free to contact me with questions, suggestions and program input. I look forward to speaking with you!